This morning we got up early and headed to the lake to spend the day with the family. Jason and I ran a little over 3 miles. It was a really crappy run for me. I enjoyed the scenery and the company, but I kept getting major side stitch, which hasn't happened to me in so long I can't even remember. I think it may have been a combination of the heat and not being hydrated enough. But, I did get it done! 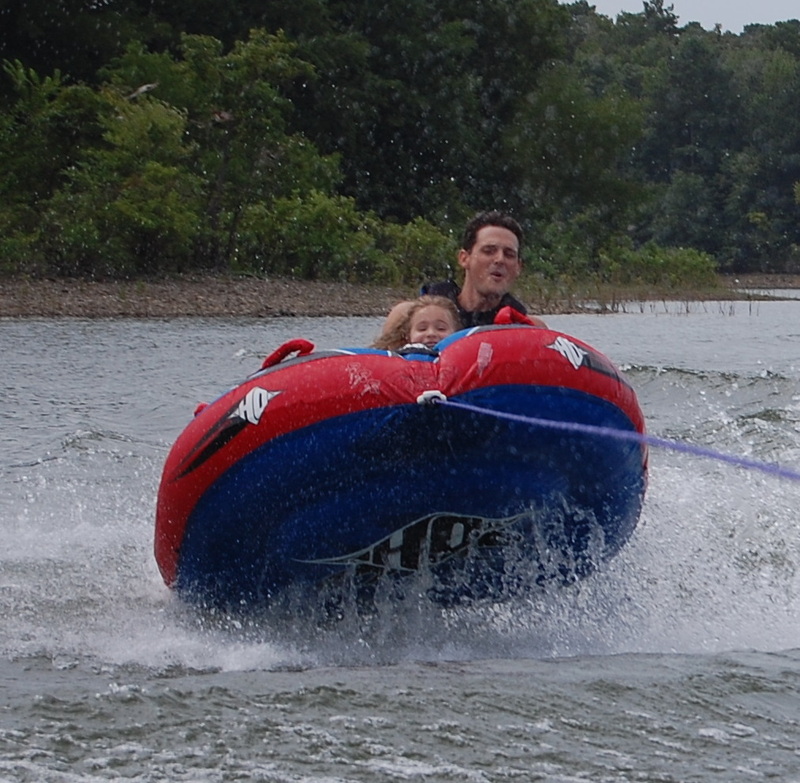 After the run, we spent the rest of the day pretty much watching Jason "Monster Tube" with my niece. She'll be 6 in October and has really come out of her shell this summer in terms of trying new things. 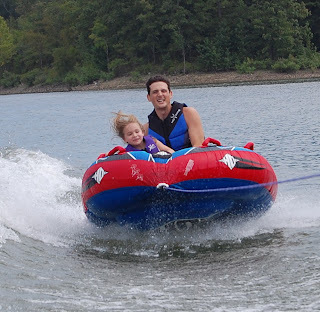 But, she will only monster tube with her Uncle Jason. He's such a trooper I must say. 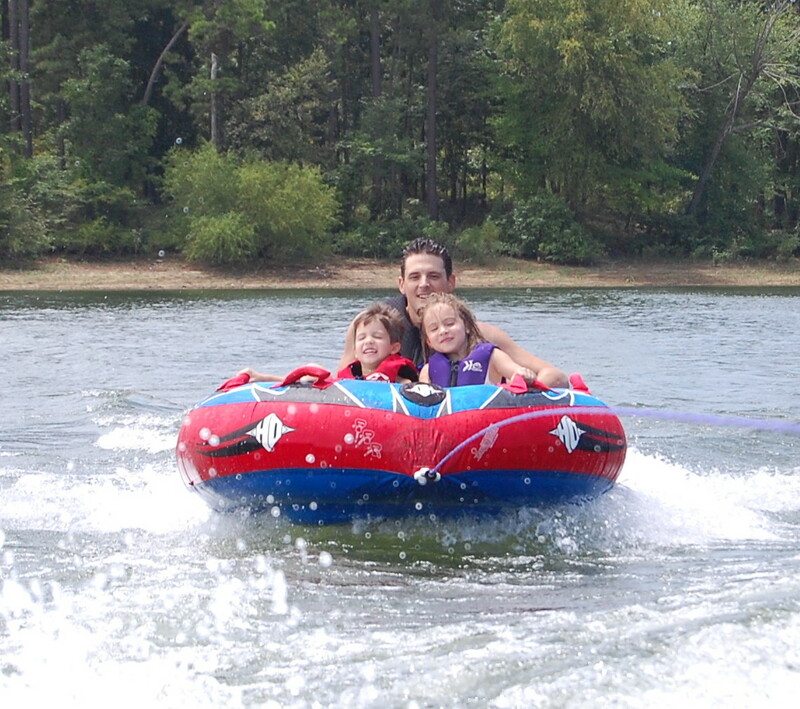 Oh, there were some cannotball (that's what my niece calls cannonballs) to be done too. We all had to jump first of course, then she deemed it safe. She wanted to jump with my sister and me. Then my dad pretended to get in on the action - I say pretend because he didn't actually jump when we thought he was. My nephew just turned 4 and is a bit more timid. He said he couldn't do cannotballs because he didn't know the rules yet. 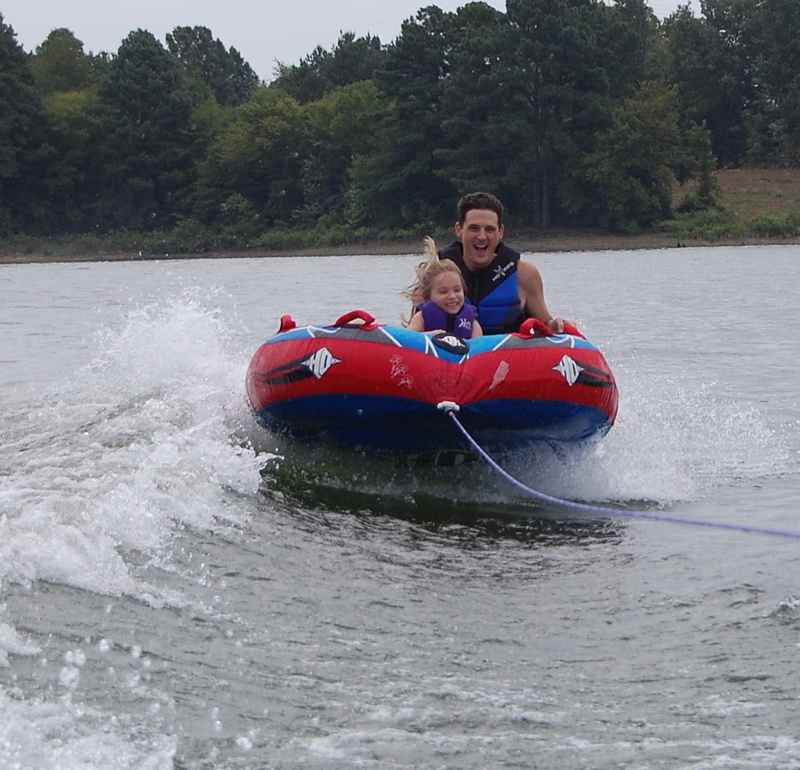 He eventually came around after we explained that the rules were, "there are no rules, just make a big splash." 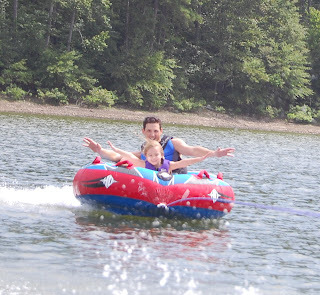 He also finally got the nerve to do a bit of monster tubing himself, with Uncle Jason and his big sister of course. The last time he tried to go for a tube ride we had a freak hail storm. This time, he seemed to be more relaxed and enjoying himself until they hit a wave just right (or wrong) and got some major air. He politely called it quits shortly thereafter. And here are just a few random shots - and yes, my sister and I wore similar bathing suits once again. Clearly we need to start calling each other before we head out. So after a great day on the lake with the family, we cleaned up and headed out again for dinner with friends. I do plan on taking pictures so long as they don't think I've totally lost my mind. Antonio is really a fabulous cook, so we're looking forward to a great dinner. LOVE all of the pictures, as usual :D You look FANTASTIC Heather!! Great arms, TOTALLY visable abs- GO GIRL!! 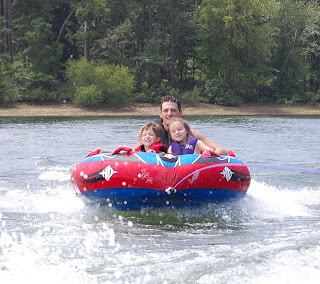 Looks like a bunch of fun today on the lake as well- you niece & nephew are too cute! Have a great time tonight! Love the jumping pictures! 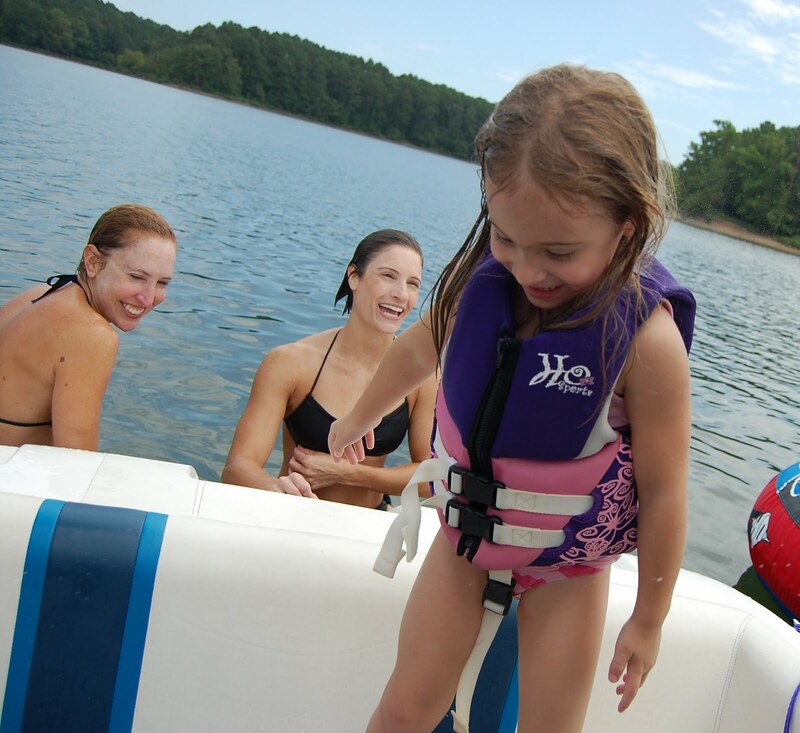 You guys always look like you have the best time out on the water! That all looks like so much fun! And that is so cute how she will only ride with him. Also, you have one rocking body! 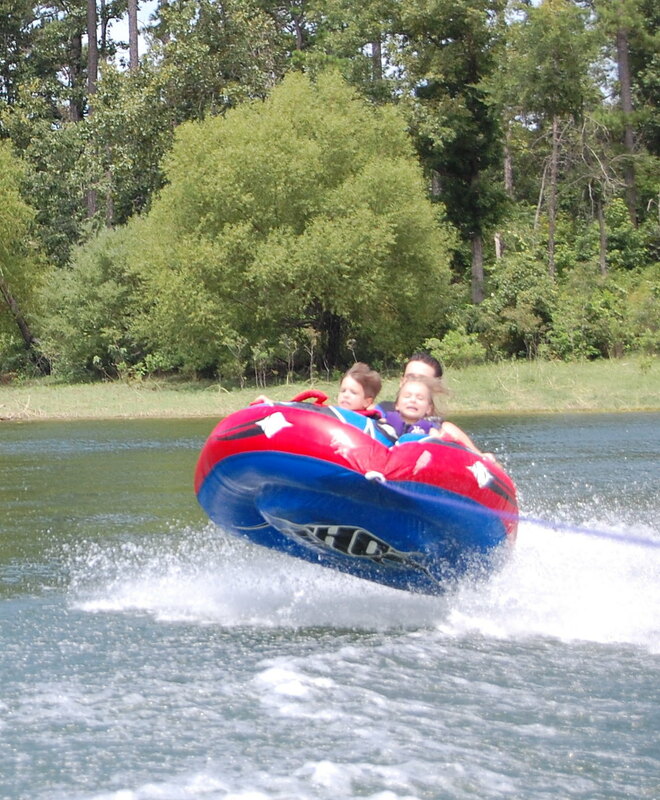 Monster tubing looks so fun! Such a fun day - I haven't been tubing in so long! You look great BTW - love the abs! omg you look amazing!!!!!!! we need to date :) kidding..
but you DO look amazing!!!! girl. I knew you had a rockin bod but i think you even pimped up your game even more the past few weeks or someting...keep it up!! it's workin whatever your doing! WOW,, just WOW! damn girl whats your secret!? your abs and arm are crazy! you should be fitness model! How cute your nephew couldn't because he didn't know the rules. :) Love the things kids come up with. There is no tubin for this girl. I had an awful experience when I was eighteen and have been seriously afraid ever since. It always looks like a blast though. i hate when runs are ruined by side stiches :[ booo but atleast you got three miles :) yay for that! sounds like an awesome day for you!! 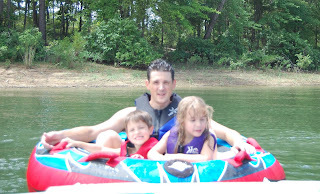 I love days on the lake!!!! Sorry about the run, but other than that sounds like a great day with the family. Looking fab girlie! So cute about the matching bikinis. You and your sis must've been beating off the boys with a stick growing up! That looks like so much fun!! I've only been tubing once and I was terrified lol. But it was terrifying in a fun way. :) Happy to see you're enjoying your weekend! Those kids look like so much fun! Great bikini body!! Hot damn!